I just talked by phone to Endro Setiawan, research team member and senior staff of the Gunung Palung National Park office. He said that the recent mast fruiting at Gunung Palung has been huge; from what he described, I estimate it may have been the biggest successful mast since 1990! It’s been a very long time since we’ve seen dense dipterocarp seedling carpets, but he said there were dipterocarp seeds everywhere, starting to germinate (at the end of July). He most recently visited the forest in the south of the park (Pangkal Tapang area), but had also observed the Cabang Panti Research Station site (central west) several weeks earlier. There, the dominant Dipterocarpus sublamellatus (alluvial) and Shorea quadrinervis (low hills) were in heavy fruit. Overall, almost every dipterocarp tree he saw was in fruit, of almost all the species. Plus all the other masting taxa: Koompassia, Artocarpus, Nephelium, Manigera, Durio (5 species! ), Baccaurea, Scaphium (3 species), etc. Such good news! This should represent a large injection of dipterocarp regeneration after many ‘dry’ years, during which we have worried that the whole local ‘masting system’ (environmental cues and pollination) may be breaking down, due to climate change, smoke, and widespread deforestation and forest degradation. 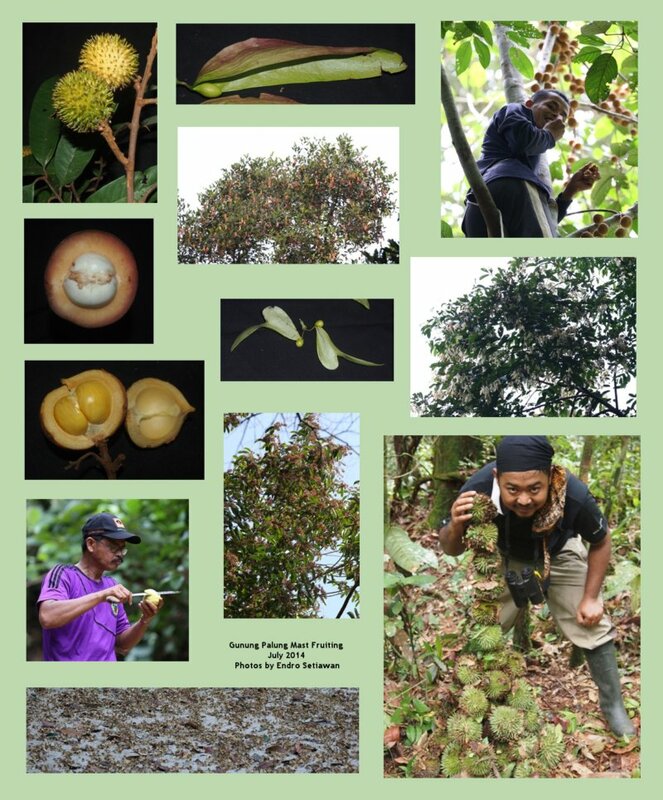 Many thanks to Endro for this wonderful news and for these photos, of assorted fruits, tree crowns, seed carpets, and himself (bottom right with teratong, Durio), Kasah (top right with tampoi, Baccaurea), and Jono (bottom left with mangga, Mangifera). I have to admit to being sad that I have missed seeing, smelling (fragrant flowers), tasting (amazing, rare fruits), and hearing (parakeets, pigs, orang utans) this whole mast fruiting event myself (too much recent traveling). But it is still deeply satisfying to know it has happened. I’ll post updates here when I get more first-hand experience.